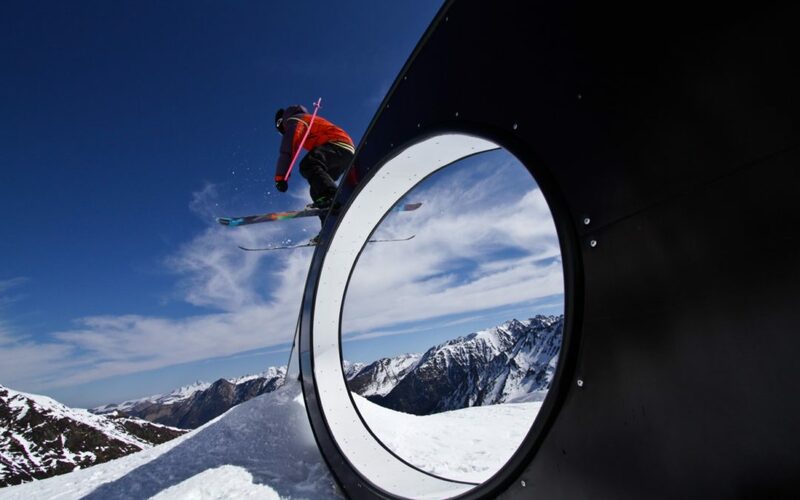 Half term is one of the busiest weeks of the skiing season – last season a combination of increasing frustration at the cost of mountain food and drinks and long queues left us wondering if we could find a better solution for skiing at this time of year. Last summer we combined a beach holiday with a few days in the Pyrenees and we stayed in a lovely old spa village, St Lary. When I mentioned to my friends that we had decided to return to there to ski for our family holiday, most looked blank with no idea where we were heading! 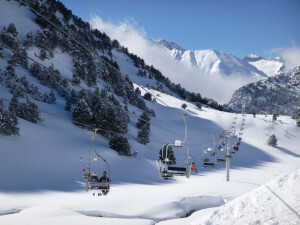 A local journalist friend of mine who lives near Toulouse had skied St Lary last winter informed me that the locals February break was actually the week after the UK half term – that made me think we’d chosen well, as I knew many other regions of France had the same half term as UK meaning the routes down to the Alps would be busy. 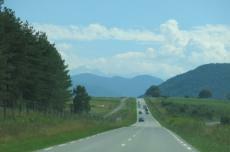 Our drive to St Lary was easy. There’s no hair pin bends to navigate, most of the 1hr 45 journey is on the A64 autoroute and then a 20 minute drive up the valley, past some beautiful old villages takes you in to St Lary. The main village sits at just over 600m, it is hard to tell how much snow is on the mountains as you cannot see the main ski area from the town. We arrived at dusk and I could see a little fresh snow with a clear snow line running horizontally across the forests above the village. We’d chosen not to ski at Christmas/New Year this season due to a friend’s wedding and various other family commitments; as we’d loved the hotel we stayed in during our summer break, we decided to treat ourselves to the same 4* hotel in the village, the Mercure Sensoria, with its huge family rooms and excellent food. In the summer we had seen the cable car heading up the mountain about 200m away from the hotel and thought this was to be our route up to ski but on arrival we spotted a different telecabine literally right opposite the hotel, we were all excited about that for a speedy first lift of the day and minimal ski boot walking for everyone. The ski hire shop was next door to the hotel and I’d pre ordered the equipment we needed which was all ready for us with no queuing, bliss. Once up on the mountain the new six man chair seemed the logical route to take. We could see the ski school groups using the area above Pla d’Adet but the new Bouleaux chair skirts the side of this area and after a quick warm up run, we headed left along ‘Corniche’ blue all the way across the mountain and on down to the Portet bubble. The weather was fairly ‘socked in’ – snowy, windy and cold so the bubble was a welcome warm up for us all. We even popped in to the little cafe at the Portet lift station for hot chocolates – a fantastically French and friendly, tiny bar! From the top of Portet bubble the Mirabelle red down to the Soumaye chair was perfect for our small group. 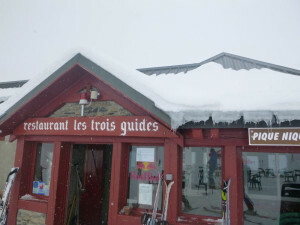 We found fresh powder to play in which had accumulated overnight and really enjoyed lunch at the ‘Les Trois Guides’ restaurant. 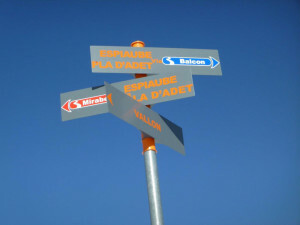 A few runs later and another long blue traverse took us all the way back to the telecabine to head down to the hotel (there is no ski run to the base) for afternoon pancakes cooked to order on the griddle. Looking at the piste map that evening, and with a clearer second day ahead, we could see there was another whole area to discover ‘Le Vallon’. The same uplift route took us to the top of the Soumaye chair but this time we dropped down the black soumaye run from the top of this summit (invisible in the cloud the previous day). My youngest struggled a bit on the steepest section but after a few nervous snow plough turns he was safely down and schussing across to the ‘Glacier’ button lift. 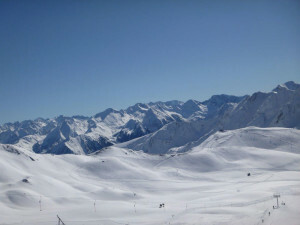 The pistes were empty – great fun cruising blue and red runs with hardly anyone on them and gorgeous panoramic views from the top. We managed to get everyone at least halfway up the steepest button lift (!) to take the red run l’oule to Refuge de L’Oule for lunch. The most beautiful run through the woods and a short pole along the cliff side path at the end brings you to this special spot. 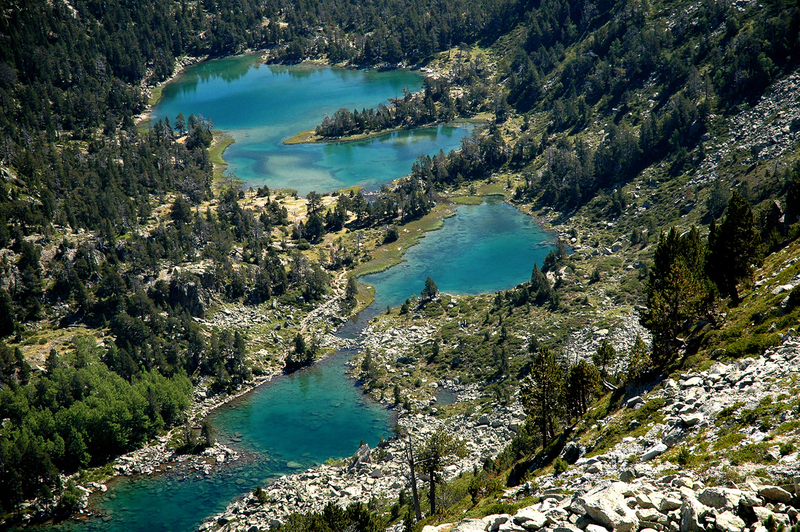 Perched above the lake, this refuge is definitely one not to miss in St Lary. Lovely terrace, more great views and a good selection of food (self service). Less confident skiers can download on the Lac two-man chair which we did later in the week and everyone who skis down has to take the chair back up to connect back in to the main ski area. 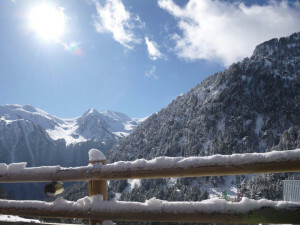 For the four days we skied St Lary, we found plenty on the mountain to enjoy – having our own car rental meant we could explore two nearby ski resorts (more of that another time). We only had one major queue and that was on our last day when the sun was shining and the locals were out in force, but with the new six man chair we weren’t queuing for long. With swimming in the thermal spa alongside the hotel (Sensoria Rio) – whose water comes from a nearby well emerging at a toasty 32 degrees (from 1200m deep)- the children were really happy – built to look like a series of caves with jets and currents it was full of playing small people, but the adult sauna, gym and separate pool offer more peaceful options. We only made the short walk into town twice – this was busy with an ice rink, jazz band playing and lots of shops with open fronts selling local produce: the black pig in all its forms, delicious cheeses and homemade nougat and another speciality from the area ‘gateau a la broche’ – like a Christmas tree-shaped cake.